﻿ KIM Guest House, Phnom Penh | FROM $10 - SAVE ON AGODA! Have a question for KIM Guest House? "Clean room with hot/cold shower." "Staff was nice to allow us to leave our bags in front of the counter." "The staffs are very helpful." 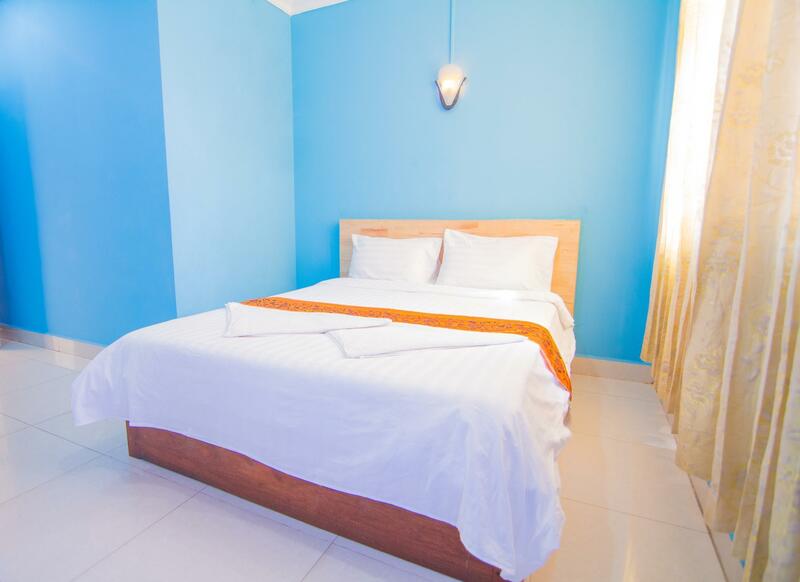 Conveniently located in Phnom Penh, KIM Guest House is a great base from which to explore this vibrant city. The excitement of the city center is only 2 Km away. With its convenient location, the hotel offers easy access to the city's must-see destinations. Take advantage of a wealth of unrivaled services and amenities at this Phnom Penh hotel. Top features of the hotel include free Wi-Fi in all rooms, Wi-Fi in public areas, car park, 24-hour check-in. Hotel accommodations have been carefully appointed to the highest degree of comfort and convenience. In some of the rooms, guests can find shoeshine kit, towels, internet access – wireless, internet access – wireless (complimentary), air conditioning. Besides, the hotel's host of recreational offerings ensures you have plenty to do during your stay. 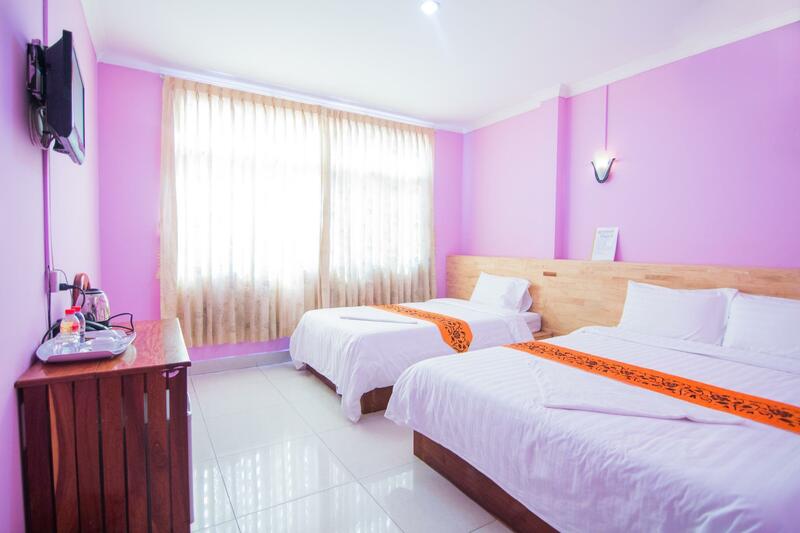 When you are looking for comfortable and convenient accommodations in Phnom Penh, make KIM Guest House your home away from home. "Had a wonderful time in this guesthouse." Aircon was very loud and not cold. The Fan and the refridgerator didnt work. No toilet paper in the bathroom. Also it wasnt very clean.Overall not a pleasent stay. We did not expect much for the price but it should be clean and the Fan etc. should work. I stayed there only one night. I checked in very late and it wasn't any problem. The service was very nice. We had also included a breakfast, which we ate in the restaurant next to the guesthouse. The only negative was the creaky air conditioner, but we had a fan in our room so for a few hours it wasn't a big deal. I totally recommend that place. Our stay here was fine but it was average. The shower was cold, the WiFi didn’t work super well, and the air conditioner functioned but was not very cool. Our room was never cleaned for the 7 nights we were there. The staff were nice but not very helpful. Our room was upgraded to a bigger one, which was nice. Location was fine - not super close to attractions or shopping/dining areas, but you can take a taxi for about $1 or walk about a mile. Breakfast was not served at the hotel but next door, which was fine. Booked this hotel for two nights. Got a spacious, very clean double bed A/C room with huge window view to the street. Bed was very comfortable. Room had TV, Fridge and coffee maker. Washroom was big and clean. The staff talk little English but they are helpful. At the entrance it may look bit old Hotel but inside the room it is totally clean and hygiene. WiFi works very fast. From here main attractions like Royal Palace, Silver pagoda, etc places on the river side are at 1-2 km away. Easily can get Grab tuk tuk (auto rickshaw) for cheap. While coming from airport to the hotel, I paid USD15 for taxi because of lack of WiFi service at the airport to book grab. But on return can book a grab tuk tuk for USD4 or cab for 8USD. Nearby restaurants are there. A recommended hotel to stay at Phnom Penh. Price is not in compair of all ,facility ! 我比较喜欢：旁边 25米 的 农产品市场 。。 This time I paid for the room fee for five days. On the first day of check-in, I declared that I would only stay for two days, The remaining three days wish be the next advance payment. Not happy to be informed that there was no room available to check in to on our arrival at Kim guesthouse, having booked in advance on Agoda . This was not a one off occurrence either, as we had two separate bookings with Kim guest house and it happened both times!!. On arrival the first time no room was available and we were moved to their hotel next door- called the Mou,. The twin room made available was clean and pleasant although a double was initially requested . (The Mou Restaurant food was awful! Avoid this at all costs!) we checked out of the Mou and walked a few doors down the road to KIM guesthouse to confirm our second booking had been received as in 2 days we will return again to stay from a tour elsewhere and confirmed we would arrive late around 11 pm. We stored our luggage safely at Kim guesthouse for free which was helpful. On our second return to KIM guest house after an 8 hour bus journey, we were very irritated that our second reservation had not been respected either, and again no room was available. This was highly inconvenient as we had a transport pick up arranged from Kim guesthouse at 7am the next morning, and they insisted we moved to another hotel, with all our luggage away from our prearranged pick up location. This was highly inconvenient. Furthermore the hotel they transferred us to, green star guest house was dirty and not a suitable alternative, but with only 6 hours to recover between one journey and the next we had very little choice but to accept a room there! Overall extremely disappointed that despite booking on Agoda, and having our booking accepted and messaging the guest house directly through Agoda and attending the guest house in person to confirm our booking and arrival time our booking was not respected, and we were highly inconvenienced by all of this. I advise you not to book with this guest house, if you expect to have a room available for you on arrival. VERY DISAPPOINTED. Pros: Friendly staff (though not speak good English), OK for 1-2 day stay, comfy bed and clean bathroom to take shower. Cons: No elevator, stiff staircases, extremely dirty common washroom (at the ground floor). Anyway, it is just 10$/night so dont expect much. 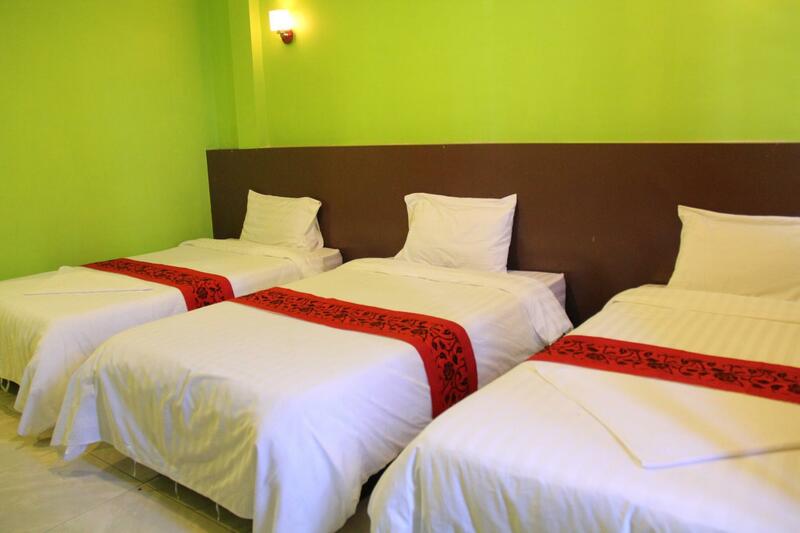 Good place, you have your own room with aircon, staff is really friendly and you have it easy to take you places. The room given to me was small, rest everything was good. Hotel staff is super friendly and they even accommodate my short notice request. The room is so spacious. It's a bit far from city center but not an issue since every place is reachable by Grab Tuktuk. So far, bedding and toilet is clean. TV, AC and Fridge function well. I will definitely recommend this to those visiting PP. Everything was great except for the airconditioners. They was so weak that we cannot feel any cold wind from them. Very good location, walking distance to the Riverside is 20-30 minutes. Rooms are nice with towels, slippers, coffee and kettle and private bathrooms. The water is cold but you can ask the staff for help. They are very friendly and helpful. They will also help getting a taxi or tuk tuk. No hairdryer in the bedroom. The room looked nothing like the pictures on their page and when asking for a different one with a window they said they were full, which is surprising considering we never saw anyone else going in or out. The receptionist wanted our key when we were leaving the guest house, almost insisting to have it for some reason, which I didn't like. The AC was okay but not very powerful. The fridge and bathroom were nice. The room was closed in and depressing. We arrived around 6:30/7 am with the night bus and asked if we could check in. Reception told us that our room was available but we had to pay an extra fee!! On agoda said available early check in with no extra fee and that is why we booked it! I tried to talk on the phone with the owner but obv ended up paying the $5 fee. Staff was totally unhelpful during my whole stay. We came much earlier than check in time. Staff was nice to allow us to leave our bags in front of the counter. We used a staff toilet to refreshen. All our belongings were safe on arrival later to check in. Good friendly staff. Room was clean and well taken care of. Don’t expect what you see in the pictures! We got a room on the ground floor, small, dark, no windows with the worse bed i ever slept in. Since I got reumatism this was devastating, i woke up in so much pain. Beds are usually hard in Southeast Assia but here the bedsprings made it feel like you were sleeping on barbed wire or something. The staff is nice but their english is bad so its really hard to communicate. Breakfast is served at another hotel but it was okey, the room was pretty clean, a bit dusty around the bed and so where they obviously miss but we usually dont care about that stuff. After one night we switched room because of the bed, the new bed was slightly better but then the A/C didn’t work... overall you can get better fot that price, since we switched after two nights we noticed that.